Model rockets make wonderful gifts for kids and it could be the start of an educational hobby that might even lead on to greater things. Many parents are looking for ways of dragging their kids away from their computer screens and getting them outside in the fresh air. Model rocketry might just be the exciting hobby that will finally entice your youngster away from Minecraft or Call of Duty! If you have never bought a model rocket before, you will no doubt have some questions about the hobby. Not least of these questions will be; is flying model rockets safe for kids and, of course, how much do model rockets cost? If you are thinking about buying a model rocket for a child, we have put together a model rocket buying guide that will step you through what model rocket equipment you will need to buy, how much model rockets and the accessories will cost, and what the safety considerations are for children flying model rockets. We’ve also provided five model rocket launch set reviews, which include helpful advice on what you will need to buy to go with them to provide your child with all they need to fly their model rocket gift. What do you need to launch a model rocket? There’s nothing worse than a child excitedly opening his gift only to find that they can’t play with it straight away. Unfortunately, buying model rockets for gifts can be like that, if you don’t know anything about model rocketry at all. Model rocket kits don’t usually come with everything that you need to launch them. Here are the basic items that you will need to look out for to make sure that your model rocket gift really is ready to fly. The first thing that you will probably look at is the model rocket itself. There is a vast range of different model rocket kits to choose from and they fall into one of five basic categories, or skill levels. Skill Level 1 model rockets are rockets designed for beginners. They only take a few hours to assemble and only a minimal amount of sanding and gluing are required to complete the construction. Level 2 rockets will take about a day to construct and they require what the manufacturers call average building skills. Model rockets in this category are not difficult to build, but they will take longer to construct than the Skill Level 1 rocket kits will. Skill Level 3 rocket kits have multiple parts that need assembling and they are of a more complex design than the rockets in Levels 1 and 2. These model rockets usually take in the region two to three days to construct and they require moderate modelling and finishing skills to complete them. When you get up to Level 4 Skill Level model rockets, you are getting into the advanced categories. These rockets are likely to take several weeks to complete and they will require quite a lot of modelling, painting and finishing. Skill level 5 model rockets are complex to construct and will take a number of weeks to complete. These are the advanced rockets in model rocketry and they require patience and a lot of modelling skills to build. For beginners, Estes also group rockets into three easy to build categories. Those categories are; Ready to Fly, which require no assembly, Almost Ready to Fly, which only take a few minutes to assemble, and Easy to Assemble, which require some gluing and will take about an hour to assemble. Once you have decided on the model rocket for a gift, you will still need to purchase a few other items for your rocket can be launched. The first of these additional items is the launch pad, which will provide the stable platform from which the rocket can be launched safely. You will also need a launch controller, which is a small electronic device that triggers the launch of the model rocket. The rocket engines, or rocket motors, are the solid fuel propulsion units of model rockets and they are sold separately, usually in packs of three or more. Rocket igniters, which are also sometimes called rocket starters, are required to ignite the rocket engine. Recovery wadding, which is made of flame resistant material, is needed to protect the rocket recovery system, usually a parachute, from the heat that is caused by the nose cone ejection charge. If that sounds like of components to remember to buy with a model rocket gift, don’t worry. We have listed all the necessary components below that you will need to make a complete model rocket gift. Are Model Rockets safe for Children? Model Rocketry has an excellent safety record, but it is important that children are aware of the potential dangers. It’s also essential that younger children are supervised when they are launching model rockets. Model rockets are generally recommended for children aged 10 years above and it is also recommend that children under the age 12 are supervised when they are launching their model rockets. For more information about model rocketry safety, read the National Association of Rocketry Safety Guidelines. If the person you are buying a model rocket gift for has never flown model rockets before, the best and the easiest thing to buy them is an Estes Model Rocket Launch Set. These sets include the rocket, the launch pad and the launch controller. You will still need to purchase the rocket engines, engine igniters and recovery wadding separately. 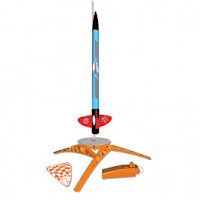 We have grouped all the necessary components together for you to make buying a complete model rocket gift set easier. Here are reviews of five of the best Estes model rocket launch sets along with details of what additional components you will need to buy to be able to make a complete flying rocket gift. The Estes HeliCAT Launch Set includes most of what you will need to launch your first flying model rocket and you will need no special skills or equipment to construct it. 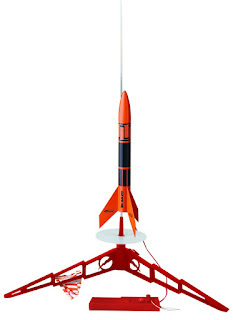 The rocket included with the set is an easy to assemble Estes HeliCAT rocket, so it will only take minutes to put together. The Estes HeliCAT Launch Set includes the Porta-Pad II Launch Pad and the Electron Beam Launch Controller, but you will need to buy glue, plastic cement, Estes engines, rocket starters and recovery wadding separately. 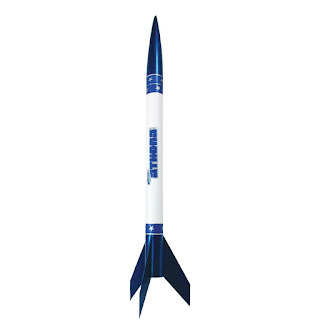 This is an ideal model rocket for a gift. It only takes minutes to assemble and it will fly up to an impressive 500 feet and then come sailing down again on its helicopter style nose cone recovery system. Wood glue, plastic cement and batteries will also be needed to be purchased separately with this model rocket. 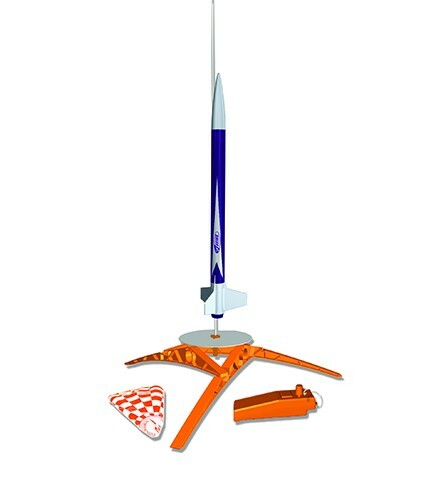 The Estes Atomic Sky Launch Set includes a full launch system and an easy to assemble rocket kit. The rocket does not require any painting or complicated assembly, but it will need some wood glue and plastic cement. The launch set comes with the Astron II Launch Controller, which will need a battery that is not included, and the Astron II Launch Pad. You will also need to purchase rocket engines and recovery wadding separately. This is a really cool looking model rocket that will reach heights of over 1,000 feet and then descend back to earth on parachutes. It’s very easy to assemble, so it would make a great model rocket gift. With the Estes Hunter's Choice Launch Set you get double the fun for your money, because you get two model rockets as well as the complete launch system. Both rockets are easy to assemble, so they will take less than an hour to put together and they will need wood glue and plastics cement, but no specialist modelling skills, and there is no painting involved in the construction. The smaller of the two rockets that are included with the Hunter's Choice Launch Set will reach heights of more than 500 feet and the larger rocket will top 700 feet. Both rockets include a parachute recovery system. You will need two types of rocket engines, one for each of the rockets, details of which we have given below. You will also need rockery wading, which will also be a seperate purchase. Batteries are also required for the launch controller. Recovery Wadding, wood glue, plastic cement and batteries will also be needed to be purchased separately with this model rocket. The Estes Riptide Launch Set comes with a ready to launch Estes rocket and that means that it makes the ideal model rocket gift for the beginner because it needs no assembly at all. There is some clipping together to do with the Astron II Launch Pad that comes with the launch set, but that’s easy to do and it will only take a few minutes. The Estes Riptide Launch Set also comes complete with an Astron II Launch Controller, so all you need to buy separately to get this rocket into the sky is recovery wadding engines, engine igniters and batteries for the launch controller. Kids will love this model rocket set because it looks so cool and it will take no time at all before they can launch it. The rocket is 18 inches tall and it will reach heights of 650 feet or more on standard Estes rocket engines. Batteries will also be needed to be purchased separately with this model rocket. 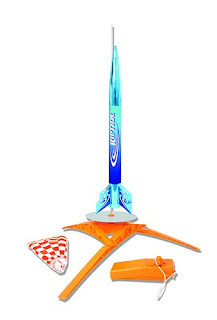 The Estes Silver Arrow Launch Set is a model rocket gift for beginners. This one falls into the easy assemble category of Estes rockets and that means that you will need some glue and a few minutes to assemble it. 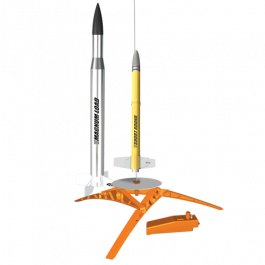 Like all the best model rocket launch sets for gifts, the Estes Silver Arrow Launch Set comes with a launch controller and a launch pad. To launch the rocket you will need to buy Estes engines, engine starters, and recovery wadding separately. The Estes Silver Arrow Launch Set rocket will reach an impressive 1,125 feet, so it will definitely make an impressive gift for any child. There is no doubt that most kids will be excited about the prospect of building and flying their very own model rocket and with these model rocket launch sets from Estes, a model rocket is a relatively inexpensive gift that be assembled and launch on the same day the child receives their gift. Model rockets are also educational. 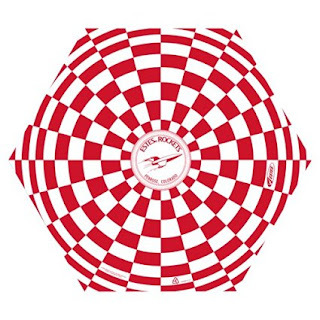 They provide an exciting way to learn the basics about aerodynamics, flight, and it even introduces some of the basic principles of physics too. Model rocks are perfectly safe when used properly, but it is recommended that children under 12 years old are supervised. That shouldn’t be too much of a problem, though, as most parents will want to be there to watch the launch anyway! We’ve only listed five of the best model racket launch sets here. 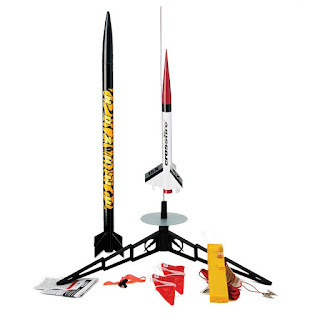 There are lots more rocket launch sets that are suitable for beginners and they are more advanced rocket kits for the more experienced model rocketeer too. We have listed the additional components and supplies that are needed with each of these best Estes model rocket launch kits, but we recommend that you check the product details when you buy any model rockets for additional items that you may need to purchase separately. We hope you found this guide to buying model rocket as gifts helpful. 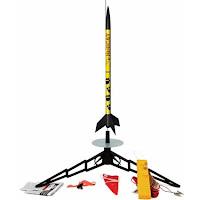 If we haven’t included a model rocket launch kit that you like, take a look at the full range of Estes rocket launch sets here, or have a browse around the Model Rocket Store menu at the top of this website. Thanks for reading and have great fun with your model rocket gift!